Again, no real celebration. Just another fake news event made up to make us feel CG loves us. Shard drop is a joke. Not only is it 1:5. Of course it's always shards you already have. No real help, unless your a noob. I guess that expecting an opportunity to consistently farm Jango was too optimistic. Revive the stores, the game needs it. Of course it's always shards you already have. No real help, unless your a noob. I haven't got Jango at 7*. Guess I'm a real noob then. Wait - both GG and GK are only at 6*. Such a nooooooob. Jesus, then don't play the game anymore if it's so terrible, you massive whiner. I don't know what I expected. I was really hoping for some a la the BH farm event, but this seems more on point. Guess I'll spend my stocked mod energy to get random shards of stuff I don't actually want, instead of being able to farm out a few extra shards of things I need. Thanks again CG for a mediocre event. 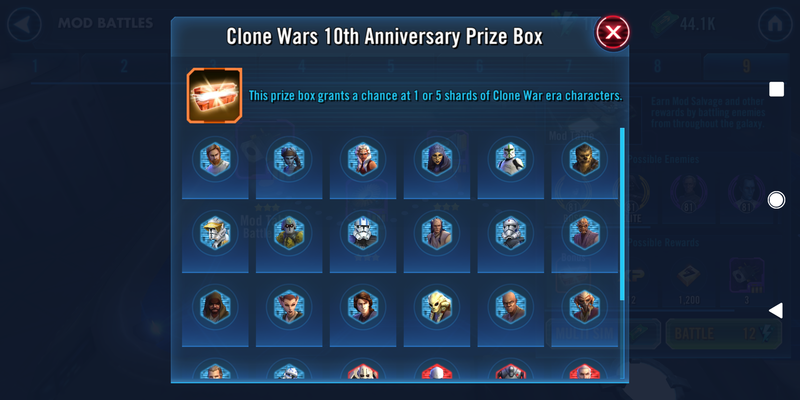 "In celebration of the 10th anniversary of Star Wars™: The Clone Wars, for a limited time, all Mod Battles Stage 9 nodes may also award bonus shards for select characters featured in the animated series, including General Grievous, General Kenobi and Jango Fett. These bonus shards will be available from 11/9 to 11/11." Yes, how dare anyone be upset when they advertised that you would get only GG, GK, or Jango shards, and then maybe planned for that by saving energy, only to find the crushing realization that there will be a basically zero chance of getting any of those, because it's not those three, but actually anyone from the TCW era. The nerve! You are literally the only person to catch that (that I have seen). Once again, CG's communication is lacking. It should have been made very clear from the start. Edit: Also, "select" characters implies "not all", which is also not correct, based on the screenshot provided. All the salt in this thread is making my blood pressure spike. This is merely a small part of the celebration, not the crowning portion of the event. Is it underwhelming? Perhaps but it is a chance at shards you might not have and it is in a section with good mod slicing stuff anyway. The "event" is fine. The (continued) poor communication is at issue. I sincerely doubt that I'm the only person who read it that way. If you just glanced at the text, you might have been misled, but the use of the word "including" before the list of characters has a very specific meaning. Big difference between including, and, oh yea, “including” as three of 20! Obviously it’s misleading even if you read it right. Interesting that you chastise people for reading comprehension when you struggle with it as well. I did not say you were the only one, I said you were the only one I was aware of, CLEARLY indicating it could have been more. Its clear false advertising and if i had stocked energy, I'd be extremely annoyed. Thanks from the future for saving me from this stupidity. If you think they weren't trying to capitalize on this misleading communication, I have a bridge to sell you. Ask your wife or girlfriend how she'd feel if you told her you only had three partners when in reality its in excess of 20, haha. If you read the message it is not clearly false advertising. It could have been worded more clearly, but is no way misleading, just misunderstood. Telling her your top 3 meals include 2 things she makes, wouldn't be saying those are the only things you like. Get some statistics. If the vast majority of the voters think that they would get those 3 characters (and so did I), then IT IS FALSE ADVERTISING. And therein lies the problem. Had it been stated with actual clarity, it would not have been misunderstood. If your customers misunderstand you, then you have not communicated properly. 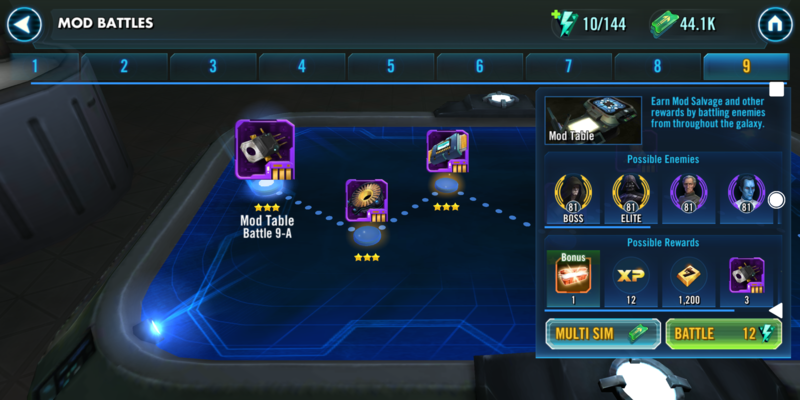 I already stocked like 800 mod energy, i also read only GG, GK and jango shards, not the entire clone wars animated characters. But what can we do, this game has always been misleading so i will enjoy the extra shards for shard currency and a lot of mod salvage, it is always like this, you gotta conform with what bone they toss you. I'm not chastising anyone, merely pointing out that the wording was clear, as long as you read it instead of skimming over it. And you'll note that I didn't say that you said I was the only one. I read it as more than the three characters too. Though I had hoped they were breaking them up more (each node having specific characters, rather than a box that could have any of them). You guys need to learn to read. CG’s message was just fine. Most people just skimmed it and got a different meaning, that’s on them. This message is clear, and I’m not a fan of CG’s choices lately, but I’ll defend them on this one. Agree it could have been worded more clearly, but when you read it and not just skim it (like I did) it is pretty clear it's not going to be just those 3. I may be reading into things, but it seems awfully convenient that the mod energy pack is today and must be bought before the drops go live, while the full drop details were never revealed and are clearly not what anyone expected. Even if you read 'including' there is no way you thought there would be a chance to receive 24+ different types of shards. Whether greed or stupidity, neither of these are a good excuse for the way this was handled. Period.